Finally trying to catch up on some news after our trip to Europe. So much art! We spent 6 hours in the Uffizzi Gallery in Florence as well as many other Galleries. La Sagrada Famillia in Barcelona was incredible. Almost every church we visited, large or small, held amazing work. The scale of the Forum in Rome was staggering as was the architectural achievements of the Colosseum and the Pantheon. I was pleased to see an old friend, the Leonardo cartoon in the National Gallery, London, but was unable to find the time to see so many other paintings I used to visit. 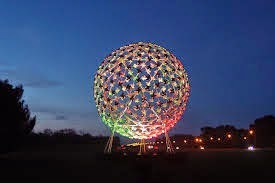 Hopefully you will have seen the campaign to bring Neil Dawson's sculpture 'Fanfare' back to Christchurch. 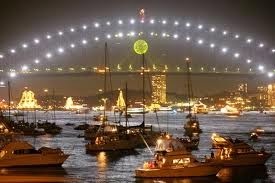 It was a gift to Australia and was hung from Sydney Harbour Bridge for the Millennium. You can be part of this . Check out the links on the pictures to see how to become a fan. On a more serious note. 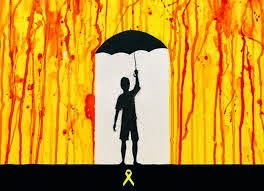 The current situation in Hong Kong has lead to a proliferation of artwork based on Umbrellas, the icon for this protest movement. Everywhere at works are springing up helping bring their message to people all around the world. Our WAKA banners from the Big Printmaking Festival are now back at Heaton and are on display in the LRC. Want to own an original artwork by a well known artist for $67. Go to St Andrew's College Friday 14th, Saturday 15th-Sun 16th November 10am-5pm. The story behind a painting.